Happy Monday, and happy Secret Recipe Club day! 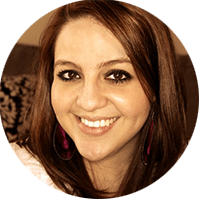 This month, I was assigned The Kitchen Witch, an awesome food blog written by Rhonda. Rhonda rides a Harley and is a mother of 6 (! ), and basically just seems like the coolest chick around. She also makes some pretty delicious looking food, and I was so excited to give one of her recipes a try. Several of her recipes are now on my to-make list, like this Orange Chicken and this Jalapeno Cheddar Cornbread. 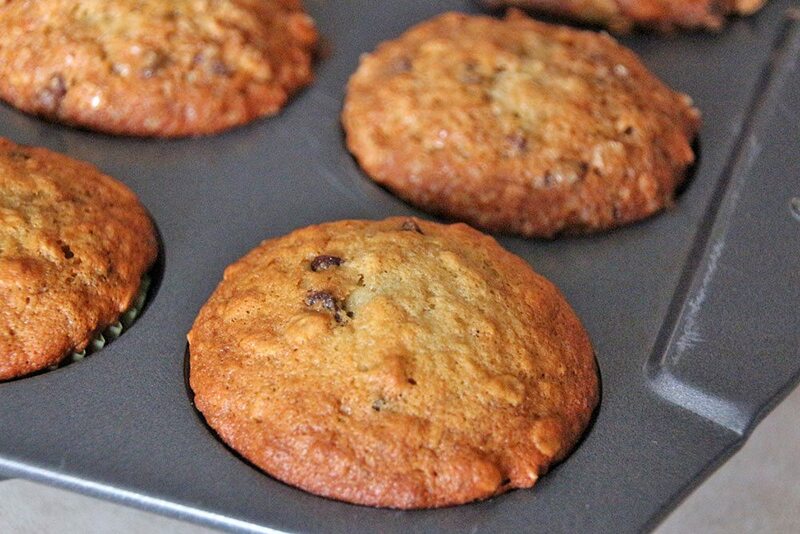 First though, I decided to make Banana Chocolate Chip Granola Muffins. We’re in our temporary apartment now (yay for insurance! 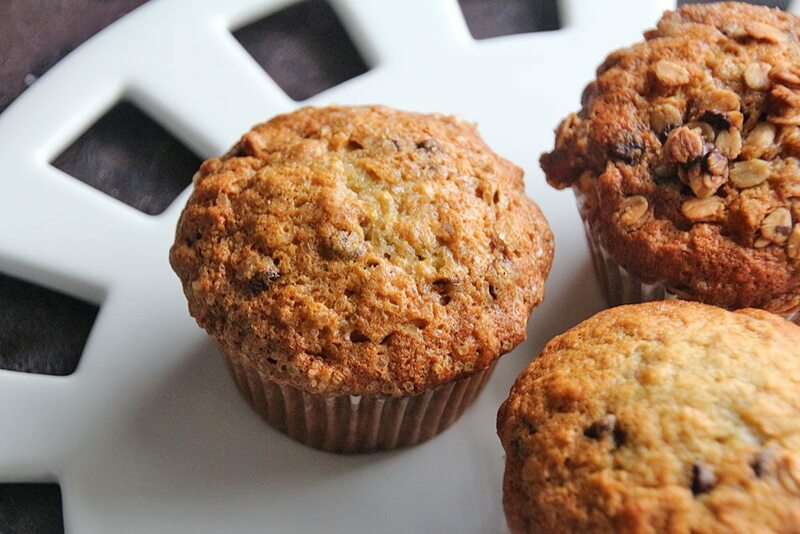 ), but I made these back when we were still staying with my parents, so we all got to enjoy the deliciousness of these muffins for breakfast/dessert (seriously, they’re good enough to be dessert). They’re moist, hearty because of the granola, and just all around so tasty. You’ll love them! 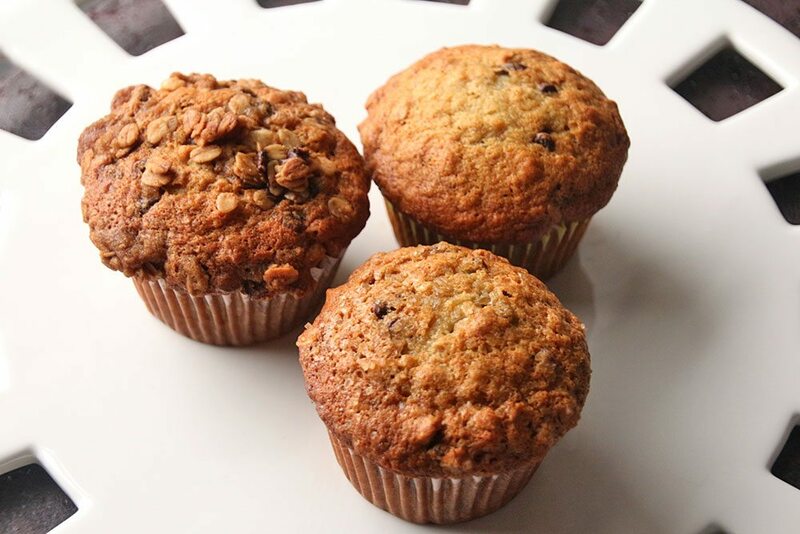 As an experiment, I decided to make them three ways: 4 muffins with the granola topping in Rhonda’s recipe, 4 muffins topped with turbinado sugar, and 4 muffins without a topping. They were all good, but the consensus was that Rhonda’s granola topping was the favorite – she knows what’s up, that’s for sure! 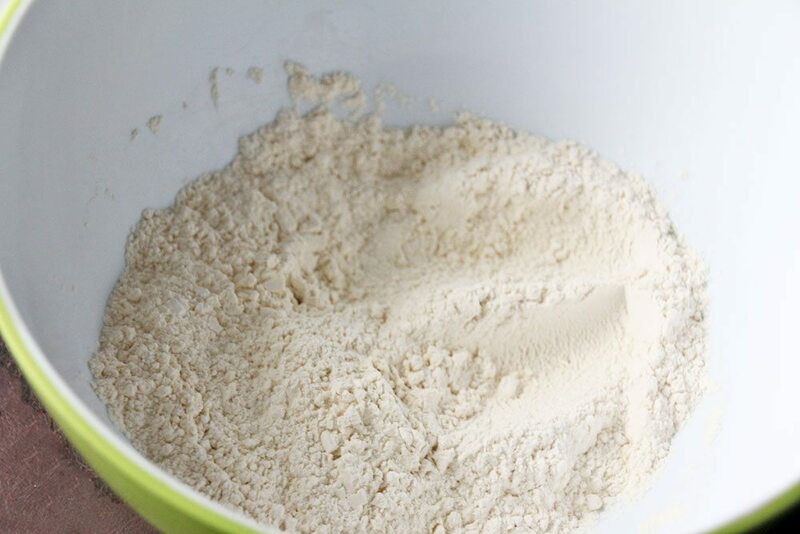 Whisk together the flour, baking powder, baking soda, and salt in a large bowl and set aside. 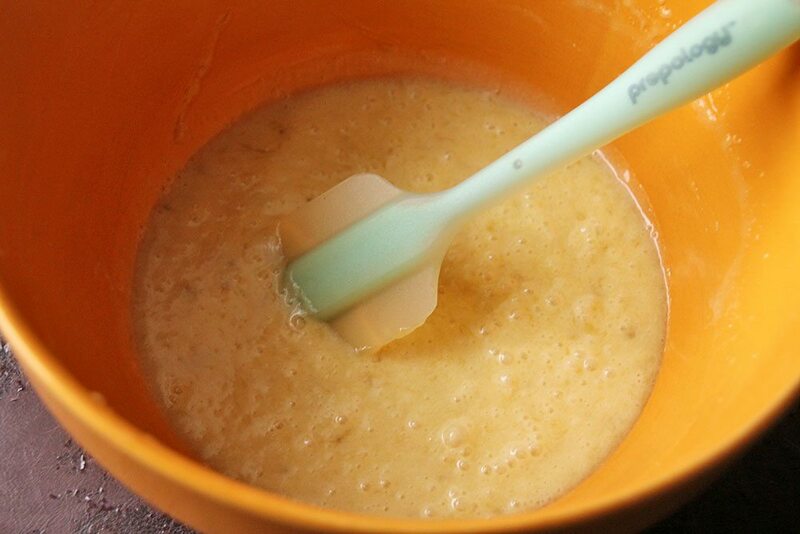 In a separate bowl, beat together the bananas, sugar, egg and butter until fully combined. 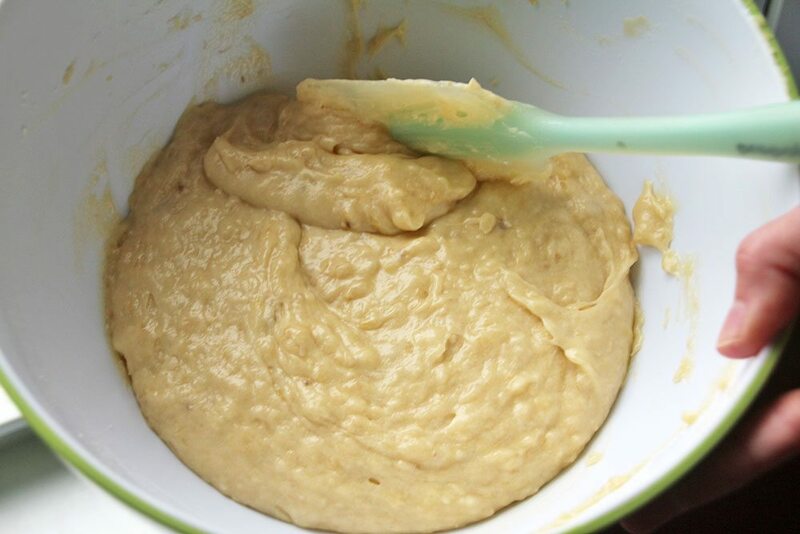 Gradually stir the banana mixture into the flour mixture. 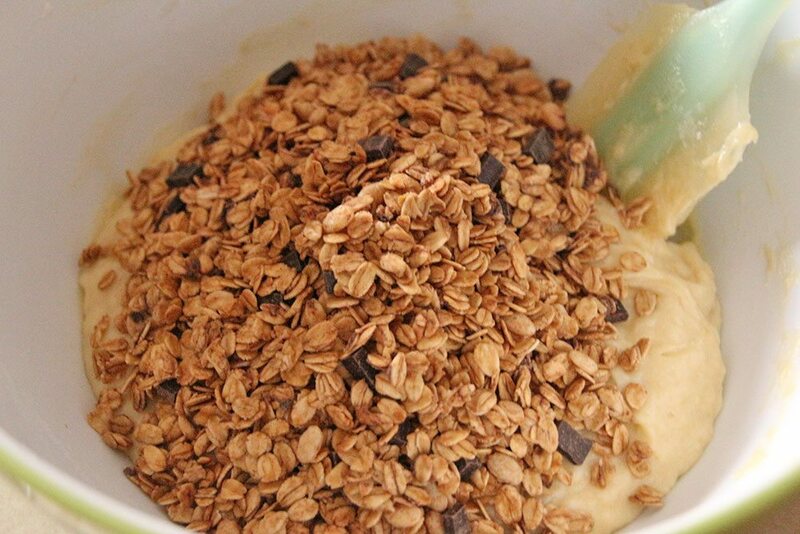 Stir in the granola and the chocolate chips. 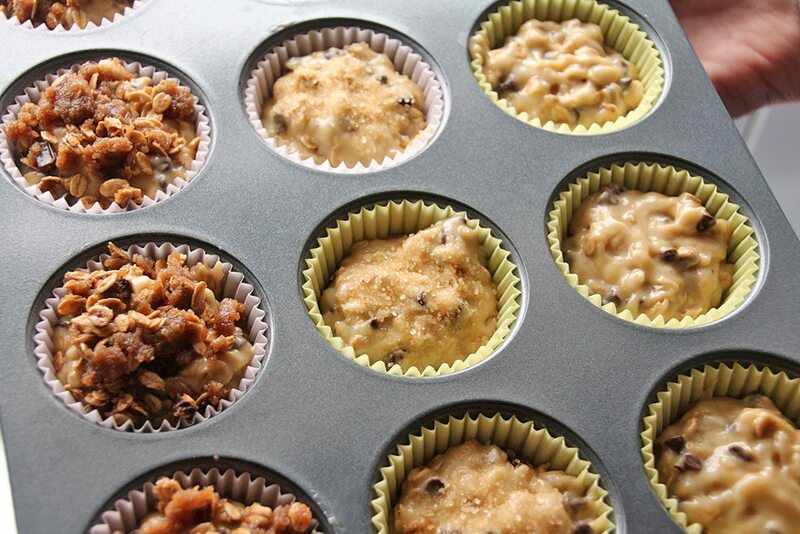 Line a muffin tin with baking cups, and fill with the batter and set aside. 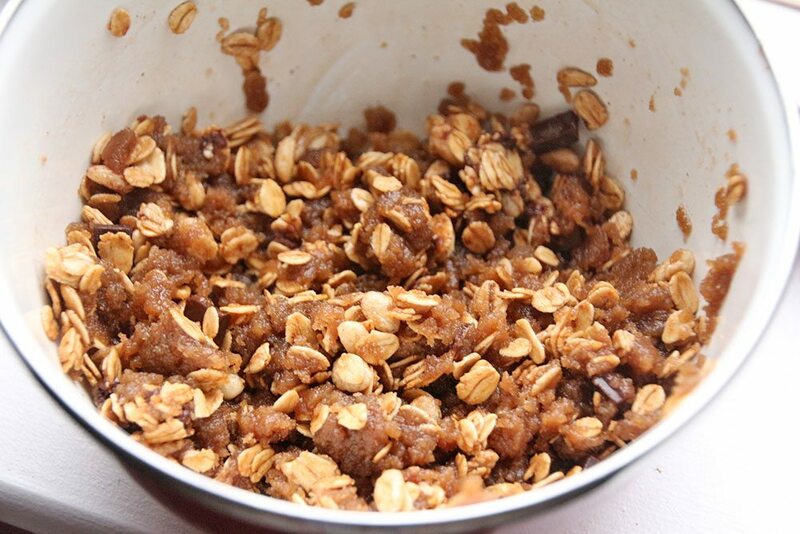 In a small bowl, combine the flour, brown sugar, cinnamon, melted butter, and granola. 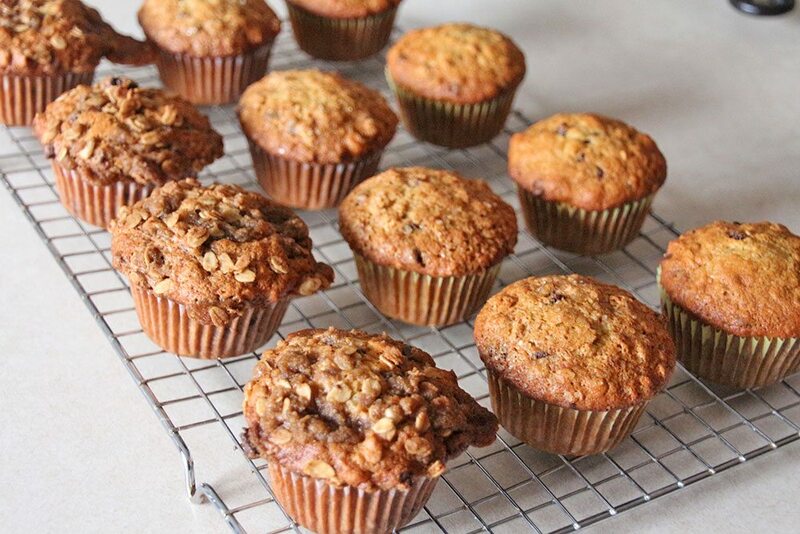 Top the muffins with the granola topping (or a sprinkle of turbinado sugar, if desired). 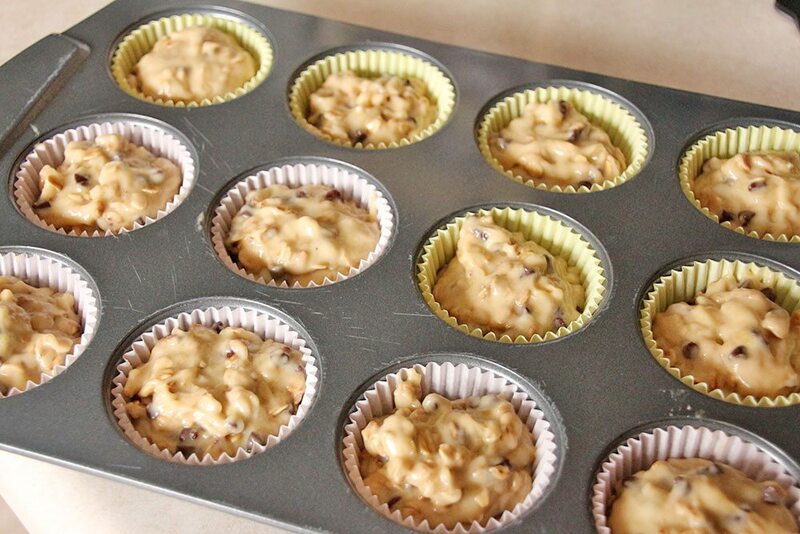 Bake at 375 for 18-20 minutes, or until a toothpick inserted in the center of a muffin comes out clean. Cool in the pan for about 5 minutes, then transfer to a wire rack to cool completely. Love these with the granola! What an awesome muffin! 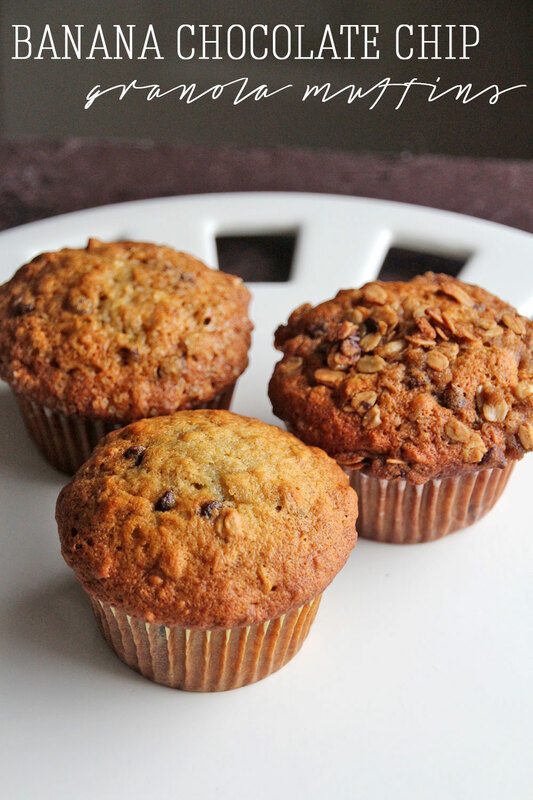 My kids love muffins and we’re always on the lookout for more! Muffins are a favorite in this house. Yours look very delicious! Love the choice of tops. 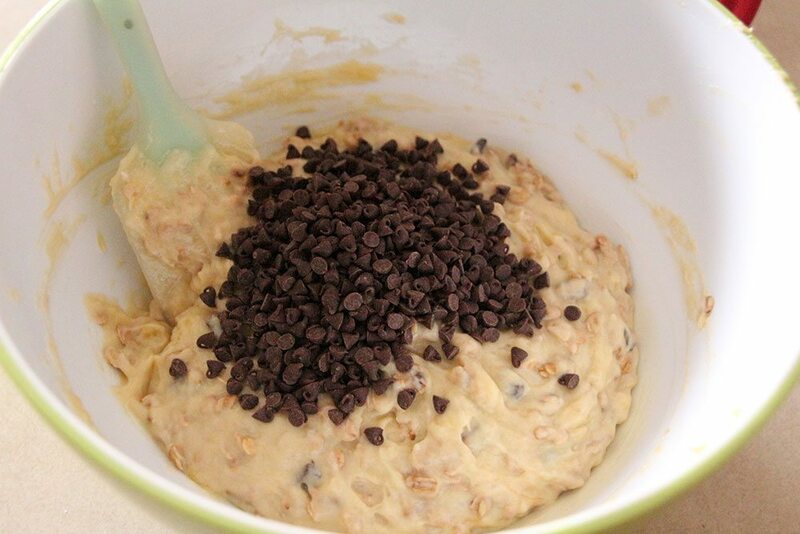 Oh my goodness I haven’t made those muffins in sooo long, you just reminded me why I need to make them again. Love how you experimented and did them several ways. 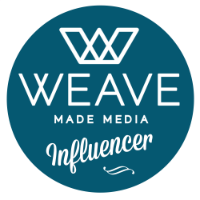 Thanks for doing them justice and the lovely write-up. Now those look delicious!!! And you can really see the texture too. Excuse me while I sit here and drool…. Your muffins sound wonderful! Yum!!! I love muffins. Always so handy to have for breakfast, snack. Just because. Adding this one to my list. 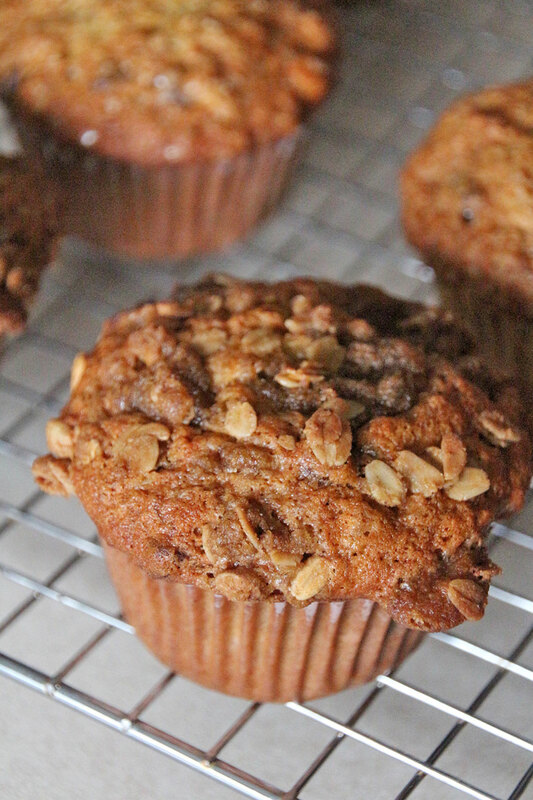 What a perfect muffin recipe to make on a lazy weekend morning. Saving to make later. Glad to be part of group C with you!